This is Jobi Masih with his rickshaw. Like Bakool, in the story below, Jobi struggled with alcohol and hopelessness until Jesus transformed his heart. After finding Jesus, both men labored hard—yet unsuccessfully—to provide for their families. 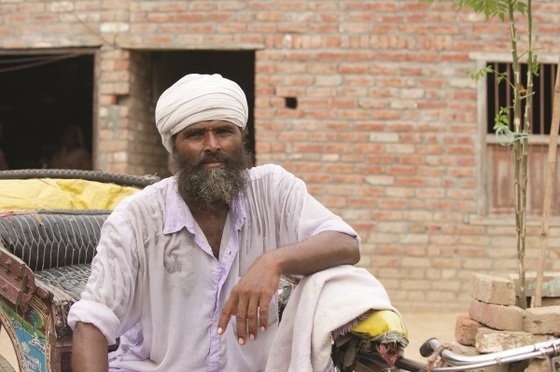 Tragedy, poverty and hardship plagued Bakool and his family for years. In the following account, Bakool relates how God intervened in his life and brought peace and practical aid to combat the poverty he faced. “I am Bakool ... I am 40 years old. I have a wife and son. I come from a Christian family. Though we were Christians by belief, we would never go to the church, and we were not involved in any church activities. I was a laborer on daily wages. Sometimes, I would get work and sometimes not. At times, I would rent a cycle-rickshaw and transport people for a living. The money I earned was just enough for the rent of the cycle-rickshaw. “There was poverty in our home. We hardly had food to eat. I was in debt. My wife used to quarrel with me. I was very discouraged because of all these things. I used to drink alcohol and do drugs to forget my struggles. My oldest son fell into a pond while he was playing, and he passed away. “Sometimes, we would fall ill, but we had no money to get medicine. I was not able to provide proper food or education for my youngest son. I would ask for money from our neighbors. People mocked us because of our poverty. I did not know what to do in my life. I was really in anxiety. Several times I thought of ending my life. I was not able to come out of this wretched situation. “[GFA-supported] Pastor Vipin was serving the Lord in our village. There was a church building that had been constructed three years ago. Pastor Vipin would visit us and counsel me from the Word of God and invite me to the church, but I did not listen to him. However, my wife and son started going to the church. Gradually, I saw their lives were changing. I also started going to the church. “I found that in spite of poverty and struggle, there was peace in my life. I decided to leave drugs and alcohol and live a life for Christ. My wife [decided to live for Jesus, too]. God helped us to live in peace with each other. The anxiety, which I had, was not ruling over me anymore. We regularly went to church. “By this time, a Christmas gift distribution program was held in our church. Our pastor saw that we were in need of a tool that would help us earn our living. Through the church, we were gifted with a cycle rickshaw. We were very thankful to the Lord and to the church leaders who gave us this rickshaw. Now I do not have to pay rent for a rickshaw. We are earning our daily living without difficulties. “I thank everyone who helped us in our poverty. Whenever I ride the rickshaw I thank the Lord and the Church. 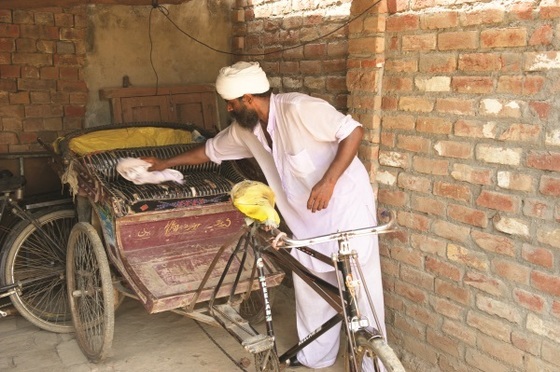 Like Bakool’s Christmas gift, the rickshaw Jobi Masih received transformed his family’s life. Jobi, who had once lived in a tent on the side of the road, was able to buy a plot of land and build a home. Through the prayers and support of GFA friends like you, GFA-supported workers in Asia can minister to people around them. These men and women regularly pray for opportunities to bless individuals both spiritually and practically. Every Christmas gift given through GFA friends is prayed over, given with love and the hope of meeting specific needs of those who receive them. Your prayers have been part of blessing Bakool and others like him. Thank you!